One of the greater miracles in Finland’s survival story is the nation’s quick unification after the disaster of 1918. The single most important factor in the unification was the introduction of municipal democracy the previous year. Starting from December 1918, municipal elections were held in all municipalities. Unlike in national governmental politics, at the municipal level there is no government vs. opposition, but all parties elected to the municipal council will receive a share of the power equivalent to their share of the votes. On 14 July 1917, the Finnish parliament passed a bill on equal and universal suffrage and eligibility in local or municipal elections, but the Russian provisional government did not ratify the law. Only after the state connection between Finland and Russia had broken off on 7 November and the parliament had proclaimed itself the highest authority (head of state) did the parliament ratify the laws on municipal democracy in the early hours of 16 November 1917. The first democratic municipal elections in which all men and women who were over the age of 20 in the election year were allowed to vote and be nominated were scheduled for March 1918, but the socialist revolution and the subsequent civil war got in the way of these plans. By the end of January 1918, the entire southern Finland was under the control of workers’ associations and Red Guards. At the local level, power was usually seized by the municipal social democratic association backed by the armed Red Guards. By May 1918, the revolution had been defeated and Russian soldiers expelled from the country. The first municipal elections were held in December 1918 and, in the rest of the municipalities, in 1919. In Helsinki, the local elections were held on 27 and 28 December 1918. The Social Democrats won 26 seats and were the biggest group in the 60-seat council. The councillors, who only a few weeks earlier had fought each other with weapons, once again engaged themselves in the business of building almshouses and schools. This is the real miracle of Finnish reconciliation. We could very well ask how it was possible. The answer is, first of all, that everyone was included in the decision-making because in municipalities there is no such thing as government vs. opposition. Many of the Reds who had a little earlier been in prison camps returned to democratic decision-making, even forming majorities in many places. In 1920, the votes cast in rural municipal elections were equally divided between socialist and non-socialist lists. Non-socialists won 58 per cent and socialists 42 per cent of the council seats. Many municipalities got councils with a leftist majority. In 1922, three of the Finnish provinces had a socialist majority. In the province of Häme, socialists had a majority in 71 per cent of the municipalities, in the province of Mikkeli, in 63 per cent of the municipalities, and in the province of Kuopio, in 52 per cent of the municipalities. Not counting the Åland Islands, the most non-socialist province was the province of Oulu, in which socialists had a majority in 8 per cent of the municipalities. Nationally, non-socialists had a majority in 65 per cent of the municipalities and socialists in 30 per cent of the municipalities. In 5 per cent of the municipalities, it was a tie. The situation changed over the course of the years: in 1936, socialists had a majority in 13 per cent of the municipalities. The local-level shift to socialist power was not painless everywhere. 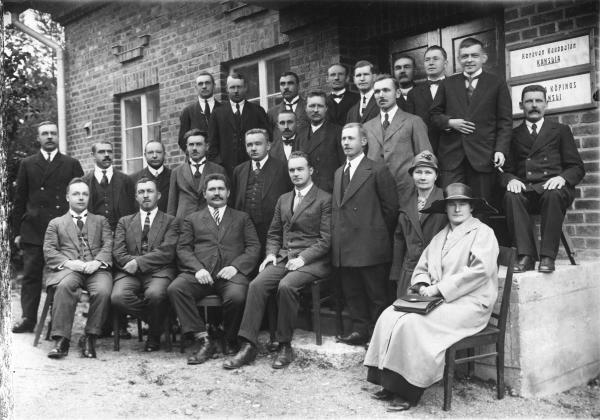 In Kaarina, the non-socialists completely withdrew from municipal government in 1920–1922. In Joroinen, lenders terminated loans after the socialists won a majority in the council, and non-socialists declined all responsible posts. However, the spirit of cooperation was restored when the socialist-led council made a statement emphasising that they would look after the municipal economy “for the common good” rather than “for the party”. Soikkanen adds that the SDP decided at the 1926 party congress that, at the municipal level, no attempt should be made to implement the “whole programme” “quickly and offhand”, but each reform had to be taken under careful consideration and reforms should only take place when the economic and other conditions were right. That same year saw an internationally significant step of reconciliation when the Social Democrats formed Väinö Tanner’s minority government in 1926–1927, only eight years after the rebellion. The affiliation of the Social Democrats to parliamentary democracy was also increased by the disintegration of the party as the Reds who had fled to Soviet Russia founded the Finnish Communist Party in Moscow in August and September 1918. The Communist Party continued its efforts to launch an armed revolution. The national integration process at the municipal level can be seen as the result of three different things. Firstly, at the local level, many important popular movements since the 19th century had created a community spirit of doing things together: the educational and egalitarian approach of the Lutheran Church, the savings bank movement, the Christian revival movements, the temperance movement, the youth movement, the labour movement, the cooperative movement. Secondly, the rule of law and democratic decision-making have very long roots in Finland. In ancient times, free men assembled together (at a ting) to make decisions. Later, congregational meetings were held to administer parish matters and arrange for the relief of the poor, which was their most important non-ecclesiastic task. The Municipal Decree of 1865 separated parishes from municipalities, established municipal boards and municipal meetings, and marked the beginning of modern municipal government. Thirdly, the labour movement had developed into a civic movement advocating for democratic reforms. When the extreme left, which campaigned for armed class struggle, broke off from the Social Democrats and organised into a communist party in 1918, the democratic labour movement was able to continue from where it had been before the failed coup. The Finnish party system is characterised by stability and continuity. Actually, only the Greens are a genuinely new party, the roots of all other parties go far beyond the past hundred years. The stability of the Finnish party system is explained by municipal democracy. The grass-roots party organisations and the participation of thousands of party activists in the municipal executive bodies are the glue that holds the Finnish society together. People on the various municipal boards learn about democracy, coming to agreement, and the pursuit of the common good. It is hard to be an extremist when you sit on the Social Welfare Board trying to solve the problems of families ridden with alcoholism and domestic violence. There are also other factors that have contributed to the rapid national integration. One important factor was the implementation of general compulsory education. All the children went to the same elementary school regardless of their social status. Conscription, too, increased national cohesion. Major land reforms and general prosperity in the 1920s facilitated the unification of the nation. The history of Finland is characterised by a high degree of continuity. Social institutions that had evolved over the centuries, such as the Lutheran Church, the judiciary, the administration and democracy, remained intact during the revolutionary years 1917–1918 and helped Finland survive as a state. National reconciliation after the civil war also contributed to the fact that Finland came out of the Second World War 1939–1945 free and democratic.